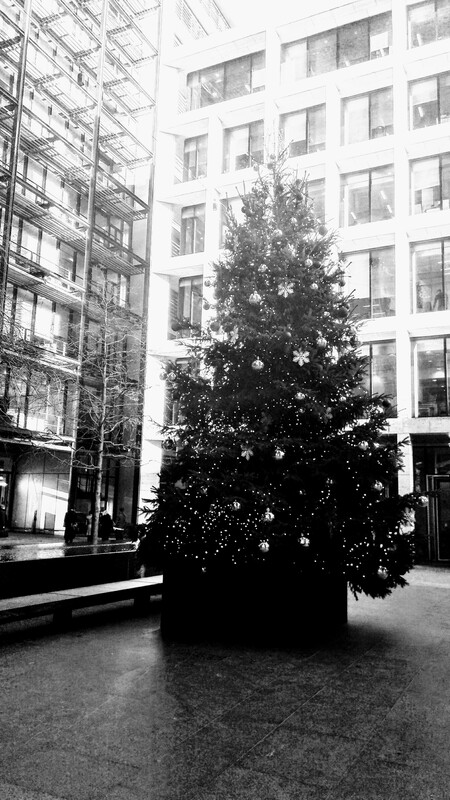 A Christmas tree sat in one of those weird public private spaces. Or are they private public spaces? The sort of place you can wander into, but is essentially private land. It often replicates public space, is a square, or an avenue, or similar, but is in fact owned by someone. And that someone can ask you to leave at any time. It is only public on their terms, for as long as they want, and for whom they choose. The security guards are discreet, but ever-present. The even more discreet signs convey your rights, or lack thereof, within the space. By entering the space you agree to being stopped and searched etc etc. I wondered if someone would stop me taking the photo. I moved on before they had the chance.